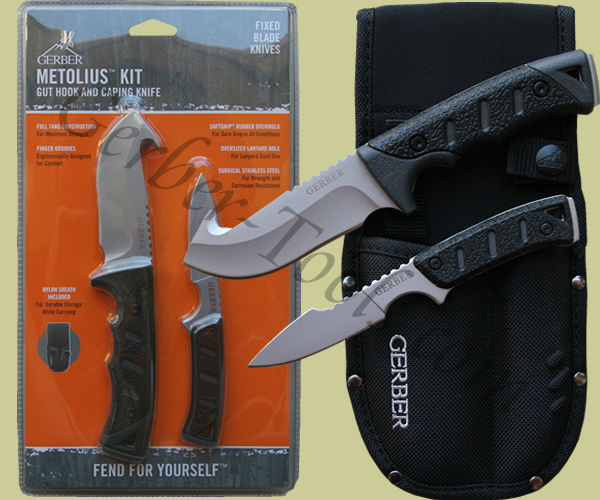 The Gerber Metolius Kit model 31-000295 comes with the Metolius Gut Hook knife and Caper knife. The kit was designed to ease the process of dressing game. Use the Metolius Gut Hook for major slices while using the caper for smaller, more intricate jobs where precision is required. The TacHide material on the handle helps you keep a good grip even in wet conditions. A sheath is included that holds both knives.